I'm starting to wonder if our image of Santa Clause as a fatherly gift giver is slowly being replaced as a business head figure. 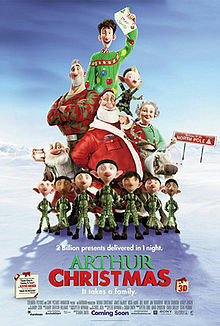 If “Arthur Christmas” is to be believed, we may have already passed the point of no return. That nagging question of “how do you deliver gifts to ALLLL the children of the world in only one night” is explained with such vicious detail in this movie, that part of me wonders if the spirit of Santa is getting lost in the need to explain this question. 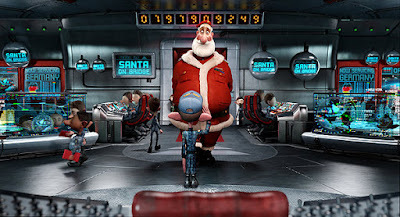 Christmas ends up being a major operation in this movie in that elves make toys; Santa's son Steve (Hugh Laurie) has coordinated everything to perfection with state-of-the-art technology, and since the elves are the ones who deliver the presents Santa has little more to do than makes an inspirational appearance. He has another son, Arthur (James MacAvoy), who answers the letters though and genuinely loves Christmas. He believes in what his dad does so much that when its discovered a child has been missed, Arthur steals the old wooden sleigh (which has been long retired in favor of a huge airship) to go deliver a bike to a girl. Thankfully, Arthur's personality and love for Christmas elevated “Arthur Christmas” well above what I was expecting it to be. It does help that Aardman Studios made this film. Like most of their films, this movie is cleverer than it is truly funny, but it's clever enough to warrant enough chuckles that could convince you it is! This is their second major feature to be computer animated. In a strange move, the characters look nothing like the “Aardman style” that everyone knows and loves. This new style is not bad and I believe they did this to show some variety, but it was a bit jarring to see. I hardly think kids will notice though: They'll be too busy laughing at Grandpa Santa getting the reindeers names wrong. Other fun touches include Santa not knowing much about his job and an elf named Bryony (Ashley Jensen), who is a specialist in gift wrapping to point where she can't wrap without putting on a bow. 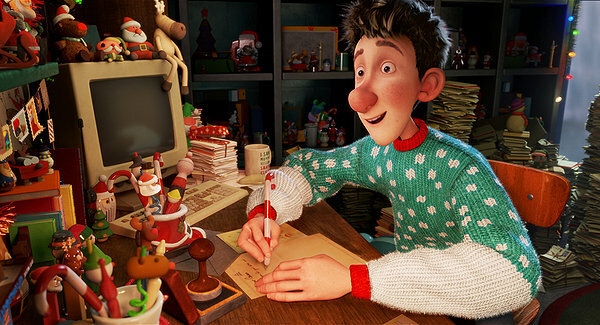 Many of the great characters are classic Aardman and (again) elevate sketchy material into something more substantial. It even gets a little emotional in the end at a pivotal moment in Arthurs plight. But again, I have to ask the question: Are we killing the spirit of Santa by explaining the golden question too much? Years ago “The Santa Clause” gave an answer to some of these questions, but left them whimsical enough that the answers still had to be taken on a leap of faith. Now Santa's operation is so well thought out and explained, that I just don't feel it's magical anymore. The more studios have to explain, the more I have a problem with it. This doesn't make “Arthur Christmas” a bad movie and I think it's fun and emotional despite these issues, but I hope future movies about Santa adds more fun and magic and less explanation. Update: Years having written the review, I am ultimately happy with giving the movie a passing grade while being similarly disappointed that it was such a mild one. Repeat viewings the charm and magic has more than won me over. It dawned on me how sensitive this movie is with the subject of how Santa works. How wonderfully human the characters are. 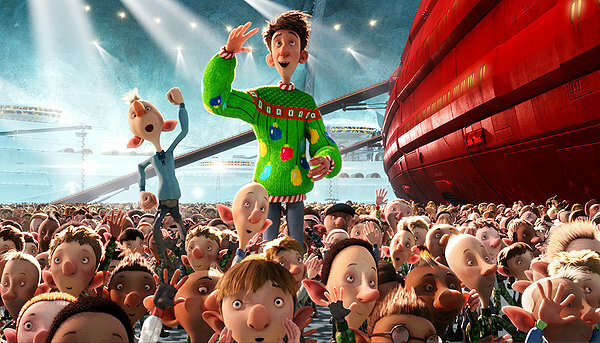 How the magic of Christmas is in every minute of this movie. The initial lukewarm review is actual a testament to this, because as I re-read what I wrote, it dawns on me I was in a bad mood. I even remember the time period of my life as being difficult. So a glowing recommendation was never going to happen, but the fact that I enjoyed it as much as I did during a time I was feeling pretty sour at the world goes to show that it did what it set out to do very well. Since then I have come to regard this as a new Christmas classic, and I'm sorry the original review didn't reflect this. For histories sake the three and a half star grade stands, but if I could do it today it would get either four stars (or more)! Parents, there is one crude joke involving a dog and a slipper, but I feel most kids won't even pick up on it. Recommended for all ages.